VATICAN CITY (CNS) — When Pope Francis travels to the United Arab Emirates Feb. 3-5, he will meet with the international Muslim Council of Elders, participate in an interreligious meeting and celebrate Mass for the local Catholic population, the vast majority of whom are foreign workers. 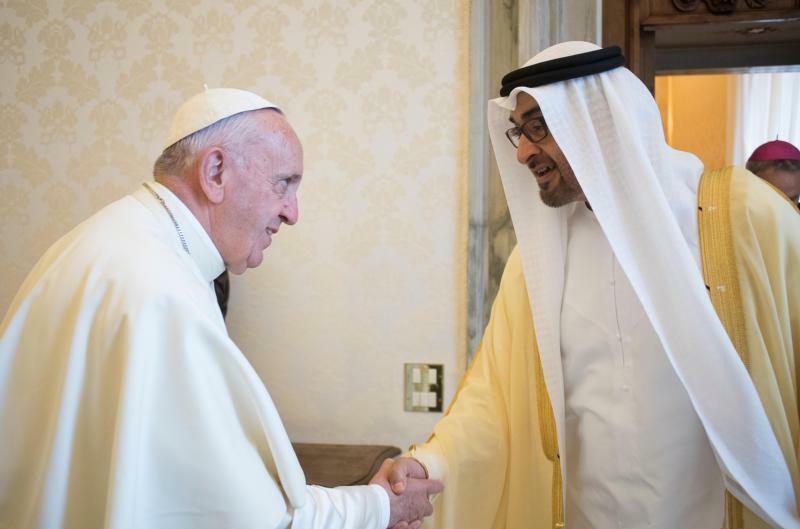 The Vatican had announced Dec. 6 that Pope Francis would be the first pope to visit the Arabian Peninsula, accepting invitations from both the UAE’s crown prince and from the local Catholic community. Here is the schedule for the pope’s trip, released by the Vatican Dec. 12. Times listed are local, with Eastern Time in parentheses. — 1 p.m. (7 a.m.) Departure from Rome’s Fiumicino airport for Abu Dhabi. — 10 p.m. (1 p.m.) Arrival at the Abu Dhabi Presidential Flight airport. Official welcome. — Noon (3 a.m.) Welcoming ceremony at the entrance to the presidential palace. — 12:20 p.m. (3:20 a.m.) Official visit with the crown prince, Sheikh Mohammed bin Zayed Al-Nahyan, in the presidential palace. — 5 p.m. (8 a.m.) Private meeting with members of the Muslim Council of Elders in the Sheikh Zayed Grand Mosque. — 6:10 p.m. (9:10 a.m.) Interreligious meeting at the Founder’s Memorial. — 9:15 a.m. (12:15 a.m.) Private visit to the cathedral. — 10:30 a.m. (1:30 a.m.) Mass at Zayed Sports City. — 12:40 p.m. (3:40 a.m.) Farewell ceremony at the Presidential Flight airport. — 1 p.m. (4 a.m.) Departure for Rome. — 5 p.m. (11 a.m.) Arrival at Rome’s Ciampino airport.